As you all remember, I got a goodie bag from Zaron Hair & Makeup a couple of weeks ago. You can check out the entire contents of the bag in this post. Here is my review of the eye shadow trio and duos. bright blue (i used this blue colour for this look), a dark gold and a line green colour. They swatch beautifully but beware of fall out. To prevent this, use a tapping motion to apply the colours. My favourite colour in this trio is the dark gold. 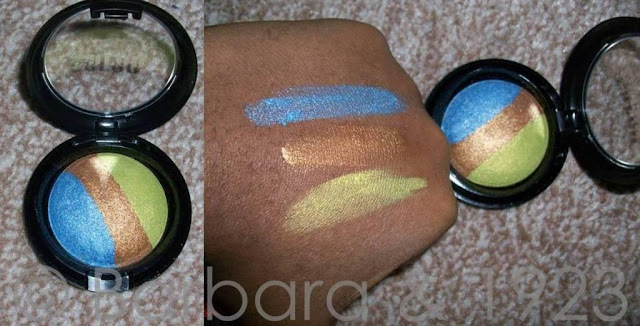 these are shimmer shadows with a satiny feel to them. fall-out is very minimal with these. Do you have a different opinion of these products?